NOTE: MY RATING OF 5 STARS is based on the operation of this saw for it’s intended use, being that it is a contractor’s portable table saw. I have gotten a lot of emails over the past 18 months or so since I first wrote this up, from folks hoping to build furniture without spending as much as a cabinet saw will cost them. I continue to feel that this saw is not recommended for high-end furniture making. You can get by with a handsaw if you have to, but if you buy this Portable Saw with the expectation of doing the type of work a Cabinet Saw is designed to do, I think you will be very disappointed. 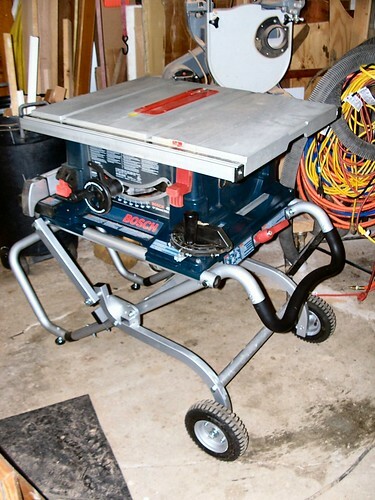 HOWEVER, it is a great portable bench-top saw, and a great folding stand, and I enjoy having it in my shop, with the ability to hit-the-road with it if I need to do that again. Recently I agreed to do a window trim project for a family, thinking that I could rip all of the boards to width at my house, and then cut them to length at the jobsite. Then after taking careful measurements the night before the job, I realized that each board would have to be ripped individually, as the older home and the new windows didn’t have very many consistent measurements. I put the windows in, so it was my fault if they weren’t all the same. Each board was close to the same width, but might vary by ¼”, which is too much to hide. So, I desperately headed to town an hour before the stores closed to find a little table saw that I could take to the job the next morning. I took it home in the box, spent about an hour assembling the folding stand, and then about 20 minutes getting to know the saw. I found that it didn’t have as much power as my Grizzly cabinet saw, but was more than adequate to cut the white oak and walnut scraps I had laying around. The blade cut quite well, without much chatter, although it wasn’t as smooth as my Forrest blades I normally use. I went through the fence/blade calibration setup described in the instruction book, and found that it was so closely aligned out of the box, that it didn’t need even the smallest little “bump” to improve it, so I left it where it was. The blade goes up and down easily, and swings from 0-47 degrees with just a twist of a lever, something I appreciate after spending the past 3-4 years cranking the dust-laden gears of my Grizzly. I hate cranking the gears bad enough, that I will do almost anything in my projects to avoid an angled cut. Now, with the new Bosch saw in my shop, I will cut the angles on it from now on. The next morning, I arrived at the jobsite, unfolded the saw’s folding legs, and setup to work. I made cuts all day long in kiln-dried cedar, the window trim material selected by the customer, and the saw worked flawlessly. I was quite happy with it, which is something I had not expected. It is a better saw than the one I used in 1998 to build the Birch China Cabinet posted on this site. Birch China Cabinet Photos: http://lumberjocks.com/projects/46. I wouldn’t want to use it everyday for my cabinet saw, but I think fitted with a great blade, the saw would definitely work for others Lumberjocks that don’t have room for a permanently placed cabinet saw, so I decided to give a little “review” of my experience. 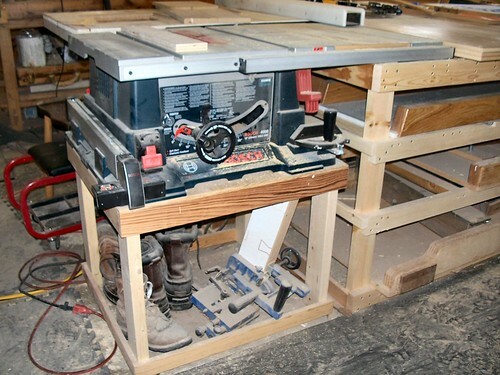 The photos show the table saw in it’s working position with the legs unfolded, then with the legs folded, and then finally with the system on the wheels where it can be carted around like a hand-truck. The rubber wheels are filled with air, and came out of the box filled with air, and work great, easily moving over broken concrete, driveway gravel, and up stairs. Out of 5 Stars, I would rate this machine a “5.” I rate this saw based upon it’s designed use, which is a light weight mobile contractor’s saw. It wouldn’t rate as high as a cabinet saw, but that is not what it was designed to do. My rating matches up with the only router I have ever bought that I liked enough to give 5 stars to, and that just happened to also be a Bosch plunge router. And, as a matter of fact, the Bosch face razor I got several years ago also worked great. Maybe these Bosch folks should start building pickup trucks. If you are ever in a store that has one of these little saws sitting on display, play around with it some, I think you too will be impressed. I am so pleased with it, that I am going to mount it on a table in my shop and use it for a second table saw, bailing me out of situations where I have a fixture/set-up on the big Grizzly saw. Then I can use the Bosch saw to make cuts when I don’t want to mess up the set-up going on the big saw. I was asked about what other saws I considered during my whirlwind shopping spree. Here is the list. I didn’t take time to list out the HP’s and all the specs or the prices. 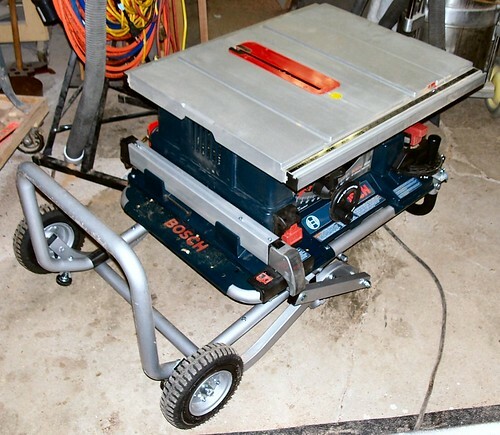 These saws ranged in price from $99 to $550, of which the Bosch was the most expensive. 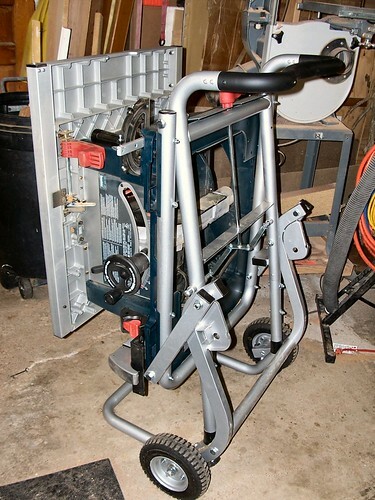 I would have taken the Porter Cable saw as a second choice, except it didn’t have the folding stand with wheels that would help me move the saw to and from a jobsite. For this reason, I chose the Bosch saw over the Porter Cable, eventhough the P-C saw was less expensive. The folding stand is easy to maneuver in and out of the pickup, and up and down stairs, and I have found is well worth the investment. Now that the window job is complete, you might be wondering what I do with the saw in my furniture work. I posted a couple of photos showing that the Bosch table top saw has found a great place in my shop to assist me in building furniture. 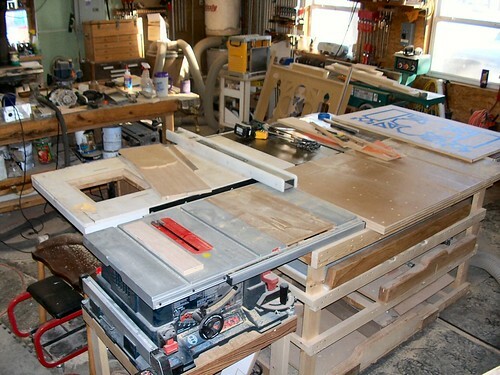 I have found that I use my large saw table for a lot of different operations, including a work bench, and so if it is more convenient to cut a board on the Bosch instead of the Grizzly, I have that capability. I had to build a wood stand for the Bosch, as the folding cart was too high to fit the height of the table. I unbolted the saw from the stand and placed the stand in storage for the next time I am called out to a job site where I need a saw. I placed my Forrest 40 tooth tenon cutting blade in the Bosch saw, and have found that it cuts very well. The saw comes with a Bosch carbide tipped blade that works great for most things, but the Forrest blade is more stable and leaves fewer saw marks on the cut. Since I have three Forrest blades, I put one of them on the saw. I did a project around Christmas time where I was cutting old antique pine boards, and I put the Bosch blade back on the saw and cut with it just in case I hit a nail. I didn’t hit a nail, but I didn’t want to take that risk with the Forrest Blade. As you can see from the mess in the phots, I didn’t clean up to take the shots. This is why I normally don’t show photos of the inside of my shop. I know where everything is, but it does look pretty messy. I don’t even seem to notice so much until I show a photo of the inside of the shop, and then I notice how embarassing it is. I was recently asked if mounting a Shop Fox fence system to the Bosch 4000 Saw was something I would recommend. Since this question is probably on the mind of others, I will post my response to the email here also. The ShopFox fence is a good one, it is what is on my Grizzly cabinet saw. However, there are better fences available now then when I bought my Grizzly back a few years ago, so other brands may work just as good. It seems like all of the tool companies are realizing that it is an important issue to woodworkers, at least the serious ones. I saw several brands that looked good at the last Woodworking Show I attended in February. If a person selects the ShopFox fence, I think they will be happy with it, but mounting it to the Bosch saw might not be what you are looking for. To mount the ShopFox, it will come with two really heavy duty angle bars that mount on the front and back of the saw. In the case of my Grizzly Cabinet saw, the angle bars bolt into threaded holes in the edge of the cast iron table. I don’t know how the light weight aluminum edge of the Bosch 4000 would take such a mating. The angle bars may be 30 lbs each, or more. When I get back out to the shop, I will look at it and see if it will work. However, my gut feel is that you would be money ahead in the long run by buying a cabinet saw that comes with the Shop Fox. For a Grizzly, this is in the $800 range. Saving the $250 on the fence now, gets you much closer to buying the cabinet saw. Having a cabinet saw will so greatly improve your woodworking, that I can assure you it is worth the extra cost to get a cabinet saw. I realize that the magazines are pushing the combination machines that look mobile and look like a cabinet saw all in one, but I personally think it is crap. I don’t make any money from any advertisers, so I can say what I think (at least so far, and if it changes, I will let you know). What makes a cabinet saw great is the heavy weight to absorb vibration, and the extra large HP motor, which is 5 HP in my saw, and the ability to run it on 220V power, which saves half of the cost of electricity. My Grizzly has three belts to deliver power from the motor to the arbor. A cabinet saw is so much more stable and powerful and vibration free, that I would not consider doing serious woodworking on anything else. OK, maybe I would gladly use a Felder Combination Machine, or a Laguna Combination Machine, but I would not use anyone’s contractor, or bench top saw for furniture work. That being said, there are many cabinet saws, the Grizzly is one of the least expensive, but there are many others that would be good also. I used a Powermatic cabinet saw for about 3 years one time, and I can not see any reason why it is better than my Grizzly, despite it being more than 3 times the cost of the Grizzly. The Powermatic is advertised as being built in America, but I am pretty skeptical about those claims from any company anymore. “Assembled” in the USA is pretty common now and I believe that, but so much is assembled with parts from a foreign country, that I am just skeptical about anyone’s claims nowadays. That being said, I know nothing of Powermatic’s claim being true, or false. I’m just skeptical. I hope this doesn’t eliminate me from the chance of winning the Powermatic Shop Giveaway that I keep entering every month on Rockler.com. (Powermatic folks: I would gladly take any of your tools I win). The Bosch 4000 saw is a good saw for what it is. It is meant to be light weight, and taken from job to job, and for doing contracting style woodworking. I like mine for that purpose. However, I would not want to build furniture with it. I would try if it was all I had, but if there was a way to sell a deer hunting rifle, golf club set, or fishing equipment on eBay, and buy a cabinet saw, I would do it in a heartbeat. I laid out in my story above the truth behind why I bought the saw, and what it was intended to do for me, and how happy I am with it in that service. But, it is by no means a replacement, or substitute for my Grizzly saw. I did put a $100 Forrest blade on the Bosch 4000, and it cuts better than the blade that came with the saw, true enough. Even with the better blade it is not as stable and vibration free as a cabinet saw. I still like having the combination of having the Grizzly Cabinet saw at one corner of my large table, and the Bosch 4000 at the other corner. This set up has saved me tearing down a setup on the Grizzly saw because I forgot to cut something. Case in Point, making the Crown Molding on my saw as I talked about in the Blog on that subject a couple of months back. With the Crown Molding set up in place, I had to cut a board I forgot about earlier, and it was easily done with the Bosch 4000. In years past, I would have to use a Skilsaw, or a bandsaw, neither of which are good alternatives. I built the “Birch China Cabinet” project that I posted here on a table saw that was a contractor style, with the motor hanging out the back. The vibration was so bad that if anything was laying on the saw top while it was running, it would fall on the floor. Also, if I didn’t put a “C” clamp on each end of the fence, it would move while I was pushing a board through the blade. Try that dozens of times a day, measuring both ends of the fence to get it straight, and keeping it that way while you tighten a “C” clamp on both ends. It is a wonder I ever finished the China Cabinet. But, I built the entire China Hutch, and many other pieces over about 18 months with that Chinese built contractor style saw, and I didn’t realize how bad I had it until I bought the Grizzly. After using the Grizzly after I bought it (convincing my wife to let me spend the money was the biggest hurdle). She couldn’t understand why I needed another saw when I had a “perfectly” good saw already. I took the contractor saw back to my dad who had loaned it to me, and I still feel sorry for him. With no table saw in the shop then, I had to buy something, right? There is a lesson there guys. In contrast, I personally have stood up a Nickle coin on it’s edge sitting on the table top with my Grizzly running, and it didn’t even wiggle. I think it would do it with a dime, if a dime had a flatter edge. What that means to a woodworker is a saw cut that is better and smoother, with very little saw kerf marking. This means that I can go straight from the saw to a glue up if I want to. Now that I have the Grizzly Jointer, I just pass it once over it, and wallah, no gap glue joints. Also, having the extra power of a cabinet saw that never slows down when cutting, and a great fence, and you have a great saw, and then great projects. I will look at whether I think the Shop Fox angle bars would mount on the little top of the Bosch and will post an update later. I’ve been considering getting one of these to take along on installations. I think you’ve sold me. We keep a Hitachi chow saw tuned on a wheeled stand to use for finish and I’ve thought we need to take a table saw and a small jointer with us as well. Probably wouldn’t hurt to take a lunch box planer as well. Then we need a dedicated trailer to haul all this stuff…..................... I think I’ll just build saddles for a while. I don’t have to install them. Ever since you did this review, I’ve looked at them in the stores. Someday I may upgrade, & I’m going to keep it on my list. I really like the collapsible stand. If I had this saw, I could sell a couple of my saws. I made a deal with my wife to sell my portable Ridgid when I got a cabinet saw. I hope I don’t regret it. Mark.. Sadly your good advice came too late. Mark, I stumbled across those same principles over the course of the past 20 years. My problem is my wife has developed rather expensive tastes. At one time, she was complaining a bit (ok…a quite a bit….ok, rather pointed comments) about the amount of money I had spent on tools for the shop. Now keep in mind that I had done this over the course of several years and had been very careful on what I had paid. The short of the story is she wanted a new wedding ring set, one with a big rock. So, being the dutiful husband, (once I got the message … and that took me a while) I went down to the local jeweler and I picked out the stone, worked up the design with the jeweler and had them make her a new wedding set, She was happy, and that made me happy. This is an excellent review. Not referring to the saw, but your presentation. I do have the older version of this saw, and it too has proven itself to be a quality machine. You might consider a side job doing reviews! I vote for a t-shirt for ya based on how extensive your review was! and, guys, I can attest to the “need” thing and the “spend money on her hobbies and needs to get your own” when it comes to buying tools – it will, most definately pay off!!! Muddler: I like t-shirts. And contrary to some beliefs, the fact that my photo is on the T-Shirt offer for LJ, I have nothing to do with the sales of the shirts. I may have the first one printed, but Martin gets all of the sales money to support the website. Martin asked to use my photo, and I allowed him, that’s all. Lee: I would enjoy doing paid reviews, but I can’t agree to any strings being attached. I would have to be able to say what I think, good, and bad, despite who has advertised in the magazine, or book. Does that ever happen? Send me one of those whiz-ding table saw things you make (Ezee-Feed), I’ll tell you what I think. Ha. I look forward to seeing your review on the Jointer. I’ve been thinking about getting one for a while. I’m tired of trying to work without one. I too have the older model of this saw with the gravity rise stand. Right now this is my only table saw due to $$$, but I can say that is has served me well. You could think about improving the fence, however I think it is pretty decent right out of the box. I chose instead to add a Jessem Mastr Slide to the saw to make it more versatile. I have been using it over a year with the sliding table and it has turned out everything from a pie safe to a bed to picture frames! Great review, this is indeed one capable saw! Not sound cocky or anything, but I don’t need to send you one to know what you would think. You would be in love all over again. As a pro, you stand the most to gain, using it. Having just recently turned the big 50; I appreciate that thing even more. Seems the plywood companies have started using heavier glue! Seriously, we’ve sold them to a couple fellows who were no longer able to handle heavy boards and sheet materials due to physical conditions. They were thrilled to find us and buy the unit. It meant they could extend their hobby for a while longer. One fellow had a serious problem with his hands, (some kind of bone condition). His Doctor is a friend of his as well as a woodworker, told him to give up woodworking. He bought our unit, and managed to continue woodworking, and also convince the doctor he needed one as well! I’ve noticed in you’re pictures, you aren’t getting any younger either. Maybe you should have your wife help you cut some plywood a few times, then come across my device on the internet. Excellent review Mark. I have the Bosch 4000 and absolutely love it. It’s extremely accurate for what I do. I don’t have the space for a cabinet saw – but most of what I build is small projects like boxes, clocks, etc. I’ve had my for several years and still feel as good about buying it as the first day. I have added a Forest WWII blade to it and that did make a huge difference in the quality of the cuts. Bottom line – Great Saw for the price.